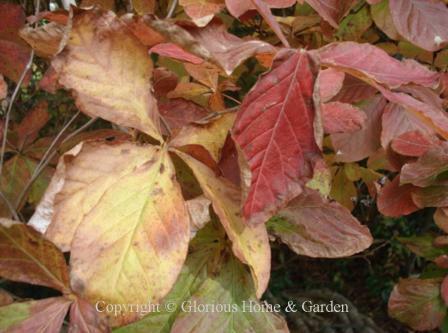 Some of our favorite garden shrubs also exhibit marvelous autumn color. Don't miss this second opportunity to add color to your garden by choosing shrubs that will do double duty. For a shady area try bottlebrush buckeye for its white 'brushes' in spring followed by lovely yellow in fall, or oakleaf hydrangea for white trusses of bloom in spring and red to purple fall foliage colors. For a sunny location, try forsythia for its yellow bells in spring followed by yellow to burgundy fall color, and Judd's viburnum with its delightfully fragrant white clusters of bloom in spring and yellow-to-red-to-purple fall foliage (one of the latest to turn color). Aesculus parvifolia, bottlebrush buckeye, Zones 4-8. 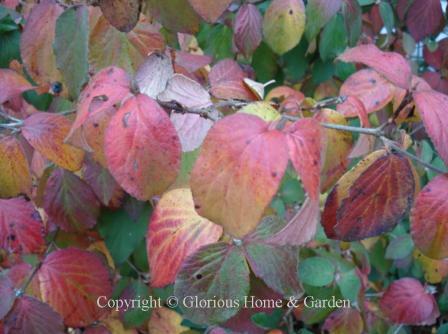 Lovely autumn color for the woodland border from this large shrub or small tree. Turns a clear yellow in fall. Enkianthus campanulatus, redvein enkianthus, Zones 5-7. Great autumn colors of orange, red and purple as can be seen on this specimen along with charming, dangling pink and cream fruits. This is one that is not much used in the South as it seems to prefer cooler temperatures. Enkianthus perulatus, white enkianthus, Zones 5-7. 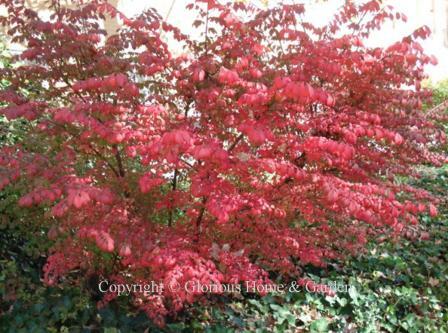 Some of the best shrubs for autumn color are Enkianthus perulatus and its cousin Enkianthus campanulatus (above). Both from Japan, they turn brilliant colors of orange and red in the fall. An outstanding example of E. perulatus 'J. L. Pennock' at the Morris Arboretum is shown below. Euonymus alatus, winged euonymus, Zones 4-8. 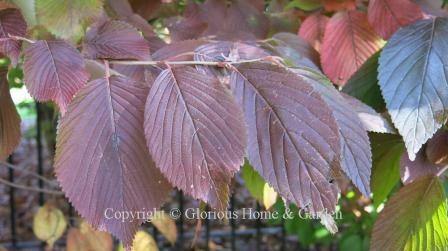 Turns brilliant deep cherry to dark red in autumn. 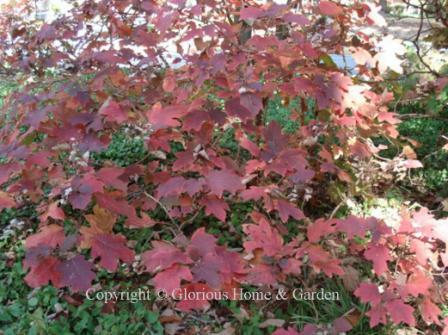 One of the best shrubs for dependable red fall color. Forsythia x intermedia, forsythia or yellow bells, Zones 6-8. 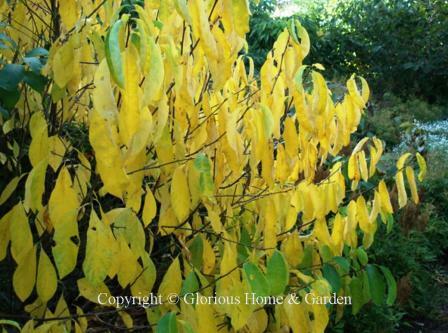 Can have shades of yellow, maroon, burgundy autumn leaves--often at the same time--but not reliably every year. 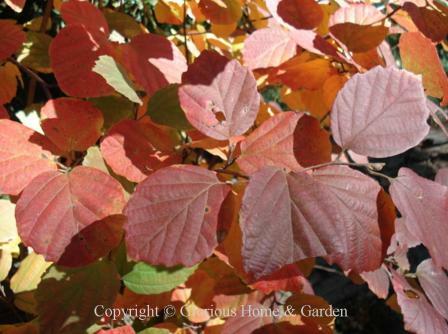 Fothergilla gardenii, dwarf fothergilla, Zones 5-8. Colorful autumn leaves can vary from yellow to orange to red, often appearing at the same time, but not always reliably. 'Mt. Airy' is a particularly dependable selection. 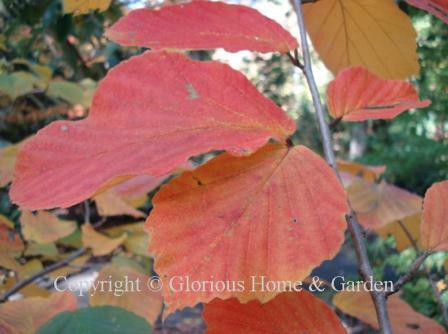 Hamamelis mollis, Chinese witchhazel, Zones 5-8. 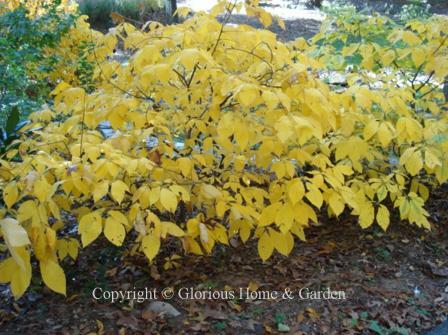 The beautiful golden autumn color on this shrub, plus the fragrant yellow flowers that occur in late winter/early spring makes it an outstanding accent in the landscape. 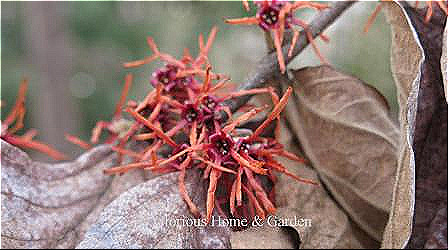 Hamamelis x intermedia 'Diane,' hybrid witchhazel, Zones 5-8. 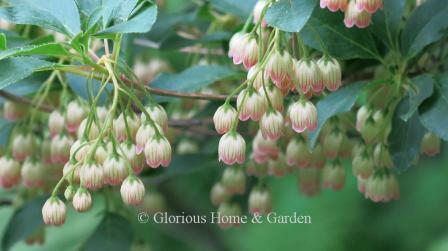 This cultivar is a cross between Chinese (H. mollis) and Japanese (H. japonica). This one taken at the Daniel Stowe Botanical Garden in Belmont, N.C. in late October was blooming as the leaves turned golden. Hydrangea quercifolia, oakleaf hydrangea, Zones 5-9. Brilliant autumn color in oranges, reds and purples on this specimen on the University of Georgia campus in Athens. Lindera angustifolia, oriental or narrow-leaved spicebush, Zones 6-8. Need a bit of fall color for a semi-shady, moist (but well-drained) location? 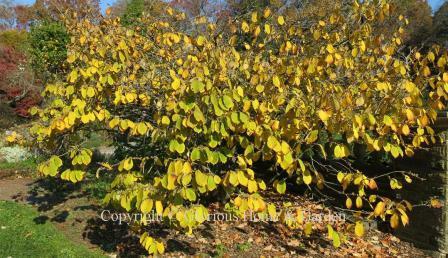 Oriental spicebush would be a good choice with its golden yellow-to-orange fall color and black fruits. The yellow spring flowers often appear before the leaves completely drop off. Lindera benzoin, spicebush, Zones 4-9. 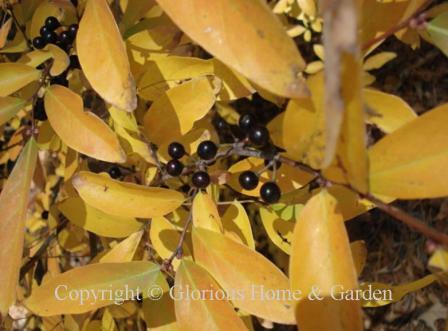 This native North American shrub has brilliant clear yellow fall color. I love the way the leaves flutter in the breeze--always eye-catching! Rhododendron schlippenbachii, royal azalea, Zones 4-6. 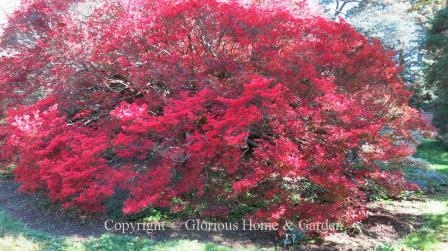 A gorgeous deciduous azalea for northern gardens. The leaves turn various shades of orange, red and yellow in the fall. This one at Asticou Azalea Garden, Mt. Desert Island, Maine. Vaccinium ashei, rabbiteye blueberry, Zones 8-9. 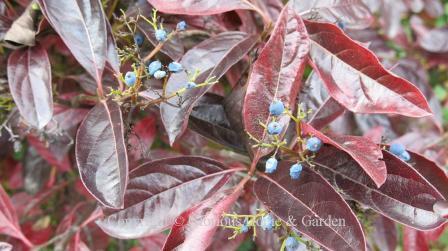 Blueberries not only produce delicious fruit, but they turn color beautifully in the fall as well. Vaccinium corymbosum, highbush blueberry, Zones 3-7. 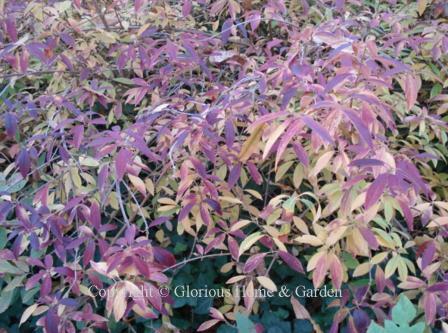 Excellent fall color, great for hedges, shrub borders. Viburnum x juddii, Judd's viburnum, Zones 4-8. Excellent in all seasons from outstanding spring fragrance to brilliant autumn color. Viburnum nudum, smooth witherod, Zones 5-9. Outstanding burgundy fall color on glossy, leathery leaves. Small blue fruits add to the decoration. Viburnum plicatum var. tomentosum, doublefile viburnum, Zones 5-7. This shrub is one of the most beautiful in the spring with its layers of pure white blooms, but it is also one the best for fall color. 'Shasta' is shown. Wisteria floribunda, Japanese wisteria, Zones 5-9. 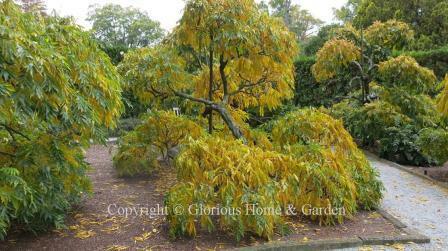 I had to include these wisteria vines trained into tree forms from Longwood Gardens in Pennsylvania because they are so beautiful, and I didn’t know wisteria could turn such lovely yellow colors in fall.